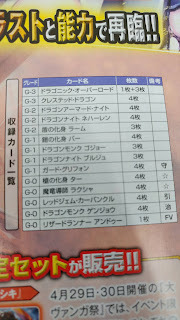 Cardfight Pro: Monthly Bushiroad leaks TD01 and 02 decklists, refers to new unit "Auspice Falcon"
Monthly Bushiroad leaks TD01 and 02 decklists, refers to new unit "Auspice Falcon"
April 4th, 2018. 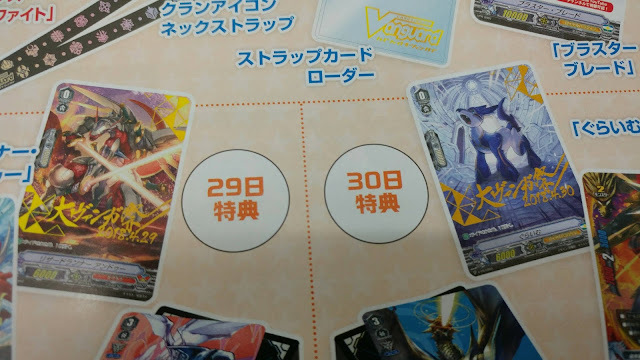 The first images out of Monthly Bushiroad magazine have hit the net, revealing several details about the upcoming Trial Decks V-TD01: Sendou Aichi and V-TD02: Kai Toshiki. At the upcoming Great Vanguard Festival, Japanese cardfighters will be able to pick up hotstamped promo versions of the Trial Decks First Vanguards, Lizard Runner Undeux and Grime. These cards are printed in the style of current Special Parallels, so they have no boxes around their skill text. Undeux will be distributed on the first day of Vanguard Fest, April 29th, and Grime on the 30th. In terms of abilities and stats these two are identical to the versions distributed in the Stardrive and Crested Dragon Start Decks, but this is our first look at their unaltered background art. AUTO: When you ride over this unit, draw 1 card. 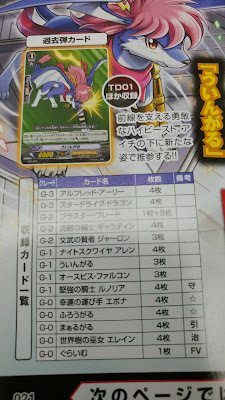 The issue also includes a comparison of the new Trial Deck cards with their original series counterparts. Below you can see V-TD01 Wingal compared to the TD01 Wingal of seven years' past. 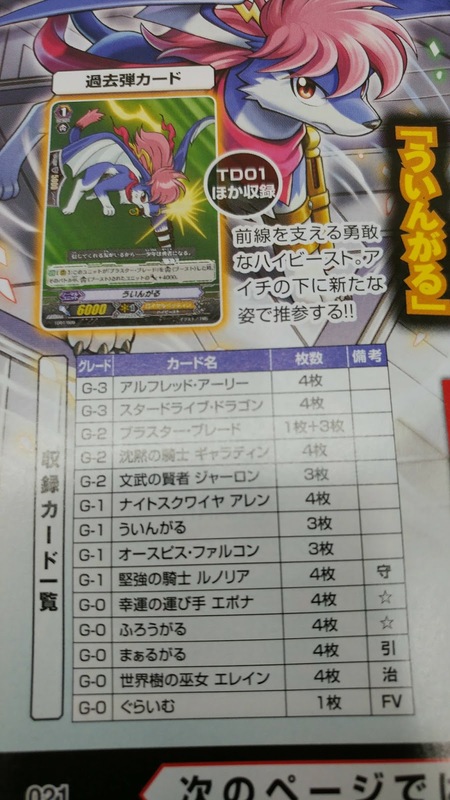 The full deck list for V-TD01: Sendou Aichi includes a new unit that we have yet to see revealed, Auspice Falcon. This month's issue of Monthly Bushiroad came with a Crested Dragon Start Deck with alternate artwork Dragon Knight Nehalems, while next month's will come with its Stardrive Counterpart.